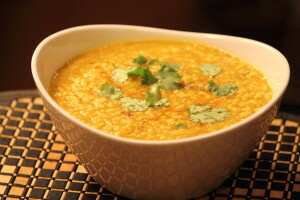 Indian recipes: This Indian recipe is made of lentils (Hindi: urad dhaal; English: black gram) and beef. Lentils (Hindi: dhaal) are a staple food in India and are available in a large variety. Dhaal Ghust literally means “lentils and meat.” This Indian recipe is so delicious that it’ll leave you coming back for more. Submerge lentils in water for at least 1 hour. You can even soak it overnight. The longer the better. Slice one onion and add it to a frying pan. Add corn oil. Fry for 5 minutes medium heat. Add the following: beef, garlic cloves, turmeric powder, coriander powder, and ginger paste. Cook for 5-8 minutes until beef is no longer red. Cover and cook for 40 minutes low heat. Make sure to stir occasionally. Wash the dhal. Add dhal to pan. Add 4 cups of water. Cook for another 20-25 on medium high until water boils. Stir occasionally. Once water boils, lower heat to medium. Let it cook for 30 minutes. Stir occasionally. Lower heat to low to avoid burning lentils. Let it cook for 20 minutes. Serve with an Indian bread like chapati. Add shredded ginger, gharam masala/chat masala, and green chili on top according to your preference. Looking for easy Indian recipes? Try Stuffed Masala Eggplant.